Massage Business Basics – Creating your mission statement and business plan can help you in creating a massage therapy business that is on track to reach your goals. Understanding that your massage therapy business IS a business is one of the first things that you will need to understand. You need to make enough money to pay yourself enough and be able to stay in business to continue to serve your clients. Creating an Online Presence – You website combined with the proper social media interaction is really all you need to start attracting and re-booking clients. It needs to be done right though so your website works. Your website needs to show up at the top of Google and all of the search engines AND make people click on the listing AND make the appointment. You do that by learning search engine optimization and also by creating articles, videos, images (content) that answers the question – What solution do you provide? Your website also needs to tell potential clients – What is in it for them? It is worth learning all that you can about websites and social media. Once you get your website dialed in, you just need to give your best massage and keep them coming back. Get my free 47 page ebook – How to get your website to the top of Google when you sign up for my free newsletter. Creating a Referral network. If you are doing everything right, people will just naturally refer their friends, family members and patients to you. How easy is that. Referrals can come from your current clients, doctors, other health care providers – just about anyone you know. The key to this is giving the best massage session for each person and learning how to talk to people in a way that shows you care and support them. There are many things that often get in the way of natural referrals just happening – talking to much during the session, giving advice to clients and not meeting them where they are at will turn a client away from you. Here are some things you will want to understand about getting referrals. 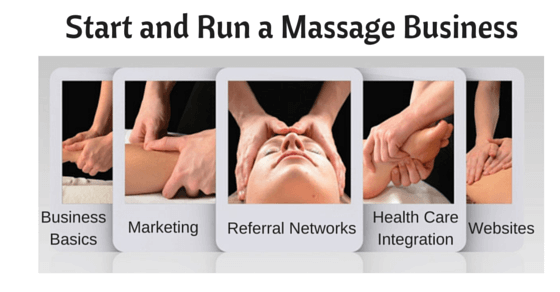 15o Massage therapy Marketing Tips – Don’t know what else to do? There are tons of things you can be doing to get the word out about your business. Personally, I would spend more time on the website than doing all of these other things, although if you would rather be doing something then this is the list you will need. Massage Insurance Billing. Learning to bill insurance for your massage therapy services can help fill in the gaps in your schedule. I do not recommend putting all of your eggs in one basket and being a business that ONLY takes insurance clients. Because there are so many fluctuations and constant changes in the insurance world, you could lose your business if the insurance companies suddenly cut your allowable fees or reduce benefits. Since billing insurance is really different in each state and each insurance company and each plan vary, you will have to learn how to bill by learning to ask the questions that will help you get paid. That will be a big learning curve in the beginning but eventually you will be able to tell which cases to take and which cases to avoid. Learn the basics of billing insurance in my book Massage Insurance Billing 101. Hiring other Massage Therapists or Practitioners – When your business is busy enough and strong enough, it may be time to consider hiring others to work for you. There is such a need for more therapists running a multi-therapist business. We need more higher paying jobs to sustain the massage profession and help in making it healthcare.